This fast-acting serum targets the restoration of radiance & skin luminescence. Active source of plant collagen, Camellia seed oil is extracted from the antioxidant-rich seeds of Green Tea. 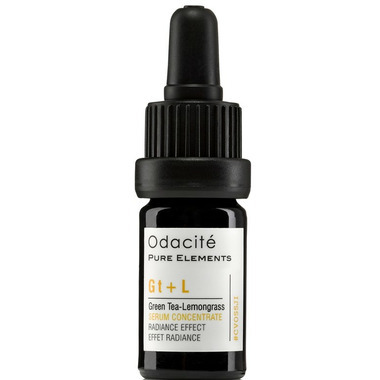 This precious oil is known to be the ancestral beauty secret behind the geishas’ skin radiance. The astringent and toning properties of Lemongrass tighten and refine sluggish, lackluster skin. Lemongrass is known, in aromatherapy, for its ability to both calm and revitalize, relieve tension, invigorate and inspire. To use: In the palm of your hand, supercharge your daily moisturizer by mixing in 2-3 drops of Gt+L. Or apply alone for a more intensive treatment. Ingredients: Highest-grade certified virgin organic Camellia (Camellia oleifera) seed oil, Certified GMO-free Vitamin E (Tocopherols) oil, Certified organic Lemongrass (Cymbopogon flexuosus) essential oil. I like this serum because it is so concentrated you only need to use 2 - 3 drops at a time. Itâ€™s great for aging mature skin like mine. This is my first time using Odacite and I am a fan. I hope to see Well.ca see carry more of the line in future.